Ian Parry has been on the more progressive side of the hard rock scene for while now - fronting activities with acts like Hammerhead, Vengeance, Andre Andersen (Royal Hunt), Elegy and also appearing on Arjen Lucassen's Ayreon projects. 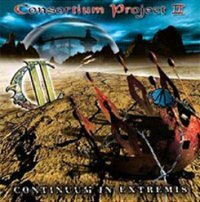 Ian Parry has just released the third and latest rendition to the realm of symphonic, progressive power metal. 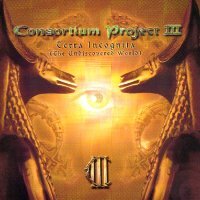 This third part is called C III "Terra Incognita" (The undiscovered World) and featured about anyone and anything you would expect of an album of this genre and format. ...such as Casey Grillo (Drums, Kamelot), Jan Bijlsma (Bass, Vengeance), Stephan Lill (Guitars, Vanden Plas) and Joshua Dutrieux (Piano & Keyboards, Elegy), as well as featuring guest appearances by the likes of Mike Chlasciak (ex Halford/Pain Museum) and Sascha Paeth (Heaven’s Gate), Ian has managed to create not only technically impressive release full of instrumental flair and extremely skilled song-writing, but also a splendid mixture of eleven very diverse, profound songs which surely appeal to fanatics of both melodic power/Heavy Metal as well as those who enjoy technical symphonic rock. Q: You have just released a new CD under the Consortium moniker called "Terra Incognita" and it got raving reviews all over the Internet Community - What is the story behind the vocalist Ian Parry? A: Well i've been making music now singing and recording since i was 17 years old and music is my passion and my dream is to have 1 hit in my carreer. Q: On "Terra Incognita" you are back with the third part of the continued concept story - can help us a little on the story here? A: Terra Incognita (the undiscovered world) is the third part of a Trilogy concept story. It's set in the future after the species (as written in the concept story of C 2) is split into 2 seperate entities by women who save the planet from self-destruction. In the new world the new generation uncover ancient writings written in stone and conclude they have to venture on a journey to discover Terra Incognita where it is written lives the monomales (men). Q: Can you describe the work proces doing this very complex new album. How did it start? How did you get the musicians to participate?.. 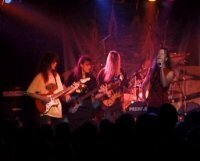 many musicians used on your album is connecting me with other progressive acts like Vanden Plas and Ayreon? A: Patrick (Rondat, Steen Peitersen) was writing and now is recording his new instrumental solo album in Germany, so we agreed he'd record the Elegy "Principles of Pain" CD in 2002, but had no time to get involved with C 3, which was planned to be released on October 27th 2003. Mike Chlasciak from Rob Halford's band contacted me via my homepage Ayreon explaining he loved C 1 and wanted to guest on one of the Consortium albums, so I invited him to Tampa where Casey Grillo has his "Above the C" Studio and together with Casey Grillo on Drums, Casey's Bassist Robert Finan, we recorded a Led Zep song for a tribute CD then Mike did solo work on track 1 "Spirit of Kindness" for C 3. Sascha Peath ask me if i could record a speaking part on the last Kamelot CD in an old english style and he returned the favour by performing a great solo on the title track "Terra Incognita". Dirk quit Elegy previously in 2003, and as he was planned to play drums for Patrick's solo album it didn't make sense time wise to have him play on C 3. Casey and me had worked on a Tribute CD, so he was the best man for the job. Thom had too many commitments with his band and couldn't find time to write or perform on C 3. Q: How do you see the CD's chance on a very complex market of today? To me "Terra Incognita" is a milestone in the progressive genre - and I haven't even heard the first two! It is very enjoyable for a "wimpy" sucker like me. A: I see the existence of the CD disappearing mainly because of illegal copying and downloading. The music industry was to late too embrace the problem and thus a new format will have to be invented. Until then, you will see the demise of many great bands and artists. A: I listen these days to some of the great snger songwriters from the 70's & 80's like Peter Gabriel. I started singing Hard rock/Heavy metal back in England in 78', just by chance after the vocalist at the time didn't show up. I original played drums in '77 for 1 year then started singing until 2003. 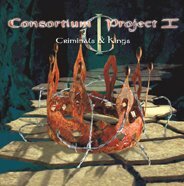 I always hoped to make an album or song that people would remember me by and maybe Consortium 3 "Terra Incognita" (The Undiscovered World) will be the CD all listeners of prog-symfo metal will want in their private collection, but it's great when i'm told by other singers that i inspired them to sing. Q: The progressive genre as well as the more melodic genres has suffered from less attention the last 5 years, but I think I can sense a certain optimism nowadays with new record companies, lots of web-sites, and lots of discussion groups on the Internet - how do you see the genres? And do you think the Internet is the rescue to the genre? A: Well the fact that people and webzines are discussing the aspects of music from progressive-Symphonice bands is great. Sadly though the impact of downloading has done more damage to sales of bands in our genre, then the positive imput via your webzines on the internet. I just hope that together the message to buy CD's and support your favourite artist can be brought across to the younger fans. As prog-symfo-metal does not have the exposure on National radio which it deserves, maybe the internet can help save our favourite music. Q: I have heard your voice on the work of Andre Andersen's solo work as well as Arjen Lucassen's - are you very busy nowadays? A: I helped out Arjen Lucassen in the past singing and re-writing lyrics from an old concept idea i wrote called "Sleeper Wake" during our days in the dutch hard rock band Vengeance. Arjen returned the favour by playing bass guitar on Consortium 1. Since then i've been touring ,recording and producing Elegy and Consortium albums. Q:How about yourself? What are you up to these days? And how about a tour and the future for Ian Parry! A: I just finished playing live shows with Elegy in Cleveland, Ohio USA and some European shows. I am presently writing new songs and hope maybe to work on some new songs with Andre Andersen in 2004. If our fans and readers of your magazine keep supporting our music, then Consortium Project and later Elegy can play some great live shows. Q: Thanks for your time. I hope that everything will work out as planned - and that you will have a #1 hit, some day!